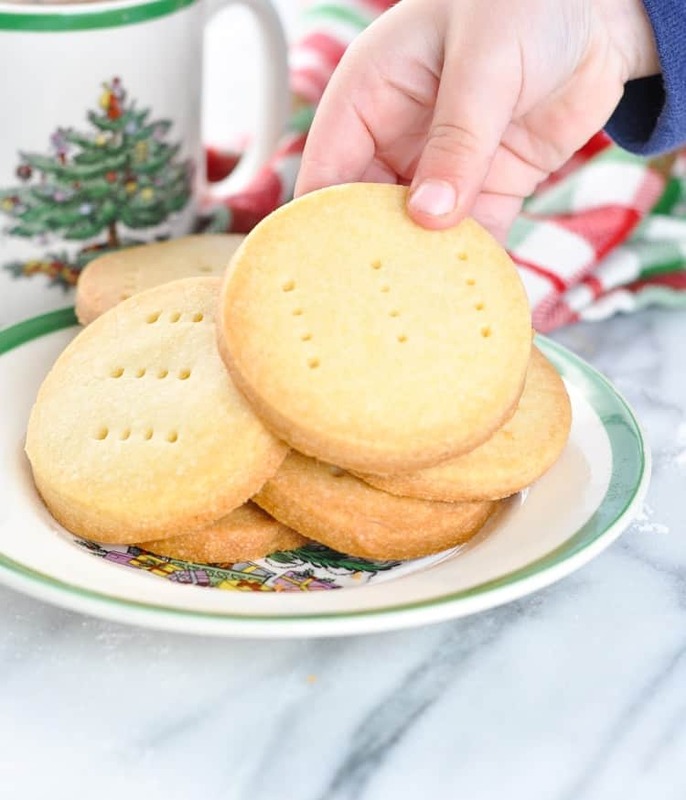 These 3-Ingredient Scottish Shortbread Cookies come from an old family recipe that has been passed down for generations, and they're perfect for holiday baking! These 3-ingredient treats are one of my favorite Christmas traditions! 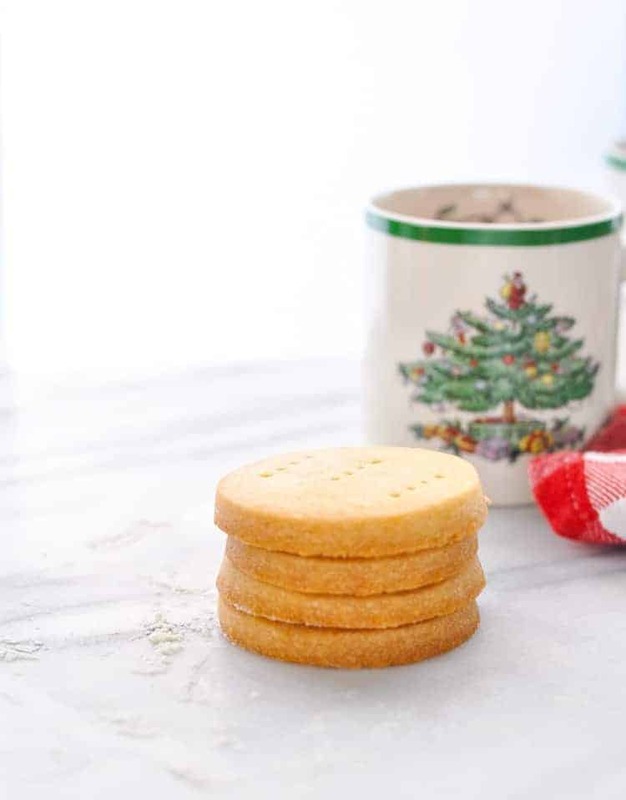 The Scottish Shortbread Cookies come from an old family recipe that has been passed down for generations, and they’re perfect for holiday baking! 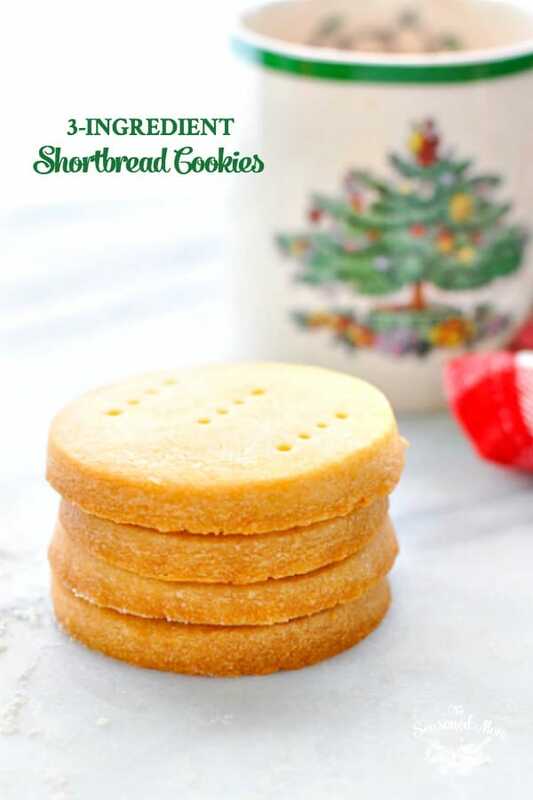 If you’re like me and you love to do some holiday baking, but you’re busy, you’ve got kids at your feet who want to be involved, and you’re not very patient when it comes to intricate, multi-step recipes, then these shortbread cookies are just the answer! While my own family isn’t exactly Scottish, the recipe comes from our Scottish friends — the Stewarts! That means that even though I’m not an authentic Scot, these shortbread cookies are definitely the real deal. Bill Stewart’s Aunt Violet shared the recipe with his family (and with us), and she received the recipe from her mother. It’s one of those gems that gets passed from generation to generation because it’s so darn good. It’s a classic! 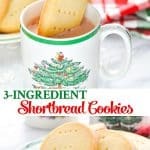 What do shortbread cookies taste like? 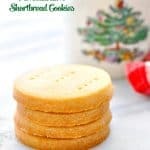 While the taste of the shortbread cookies sends me straight back to my childhood, I love them just as much as an adult. They’re not too sweet, they’re perfectly buttery, and they’re ideal for a snack or dessert with a cup of coffee, tea, or hot cocoa. If you’re not familiar with a traditional shortbread recipe, butter is definitely the prominent flavor. In other words…they’re amazing! Are shortbread cookies and sugar cookies the same? No, they’re not. Sugar cookies require many more ingredients than shortbread cookies, and the sugar cookies are typically sweeter, with a lighter, crisper texture. 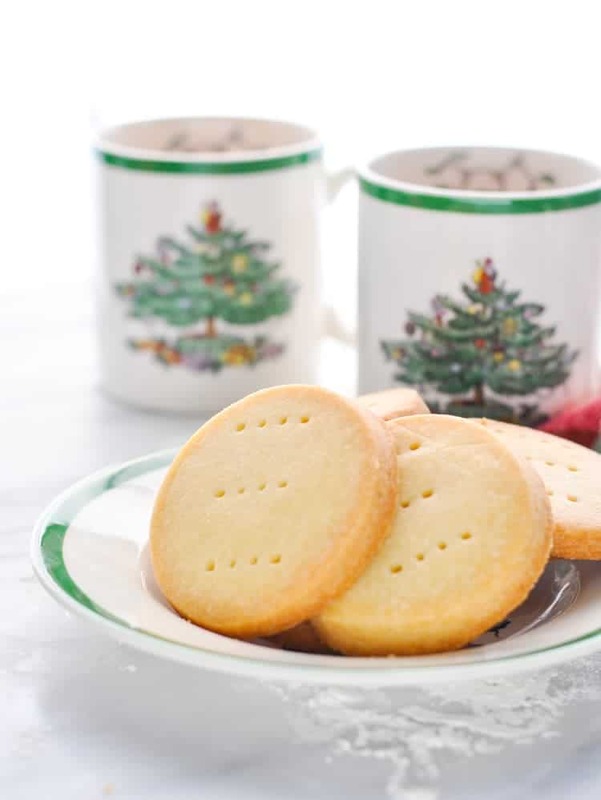 Here’s the best news of all: a basic shortbread cookie recipe only requires 3 ingredients! Nope, you don’t even need eggs for this recipe! With such a simple ingredient list, you can have hot-from-the-oven shortbread cookies in less than 1 hour! To prepare the dough, simply mix together the butter, flour, and powdered sugar in a bowl. There are no special skills required, so just let the mixer run until a nice ball of dough forms! 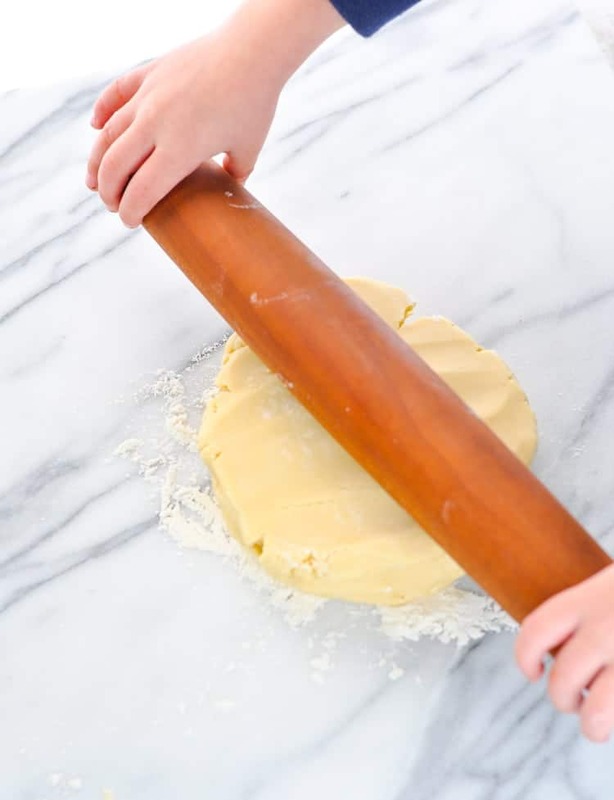 Get your kids to help you roll out the dough, and then it’s time for cutting! This is really up to you! When I was growing up, we loved to use Christmas-themed cookie cutters to shape our shortbread. Classic Scottish shortbread, however, is often cut into rectangles or rounds. and we also used a pizza cutter to slice the rest of the dough into rectangular strips. Bonus tips: the traditional rectangles are perfect for dipping in coffee or hot cocoa! Pierce the cookie dough with a fork, and then bake the cookies in a 325-degree F oven for about 20 minutes (or just until lightly brown). While a classic Scottish shortbread doesn’t typically have icing, the buttery cookie does provide a great decorating base for Christmas cookies! If you (or your kids) prefer shortbread cookies with icing, then I suggest preparing a batch of royal icing and getting creative! There’s no wrong way to do it — so throw on some red and green sprinkles and have fun! Get ready. Get set. DIP! 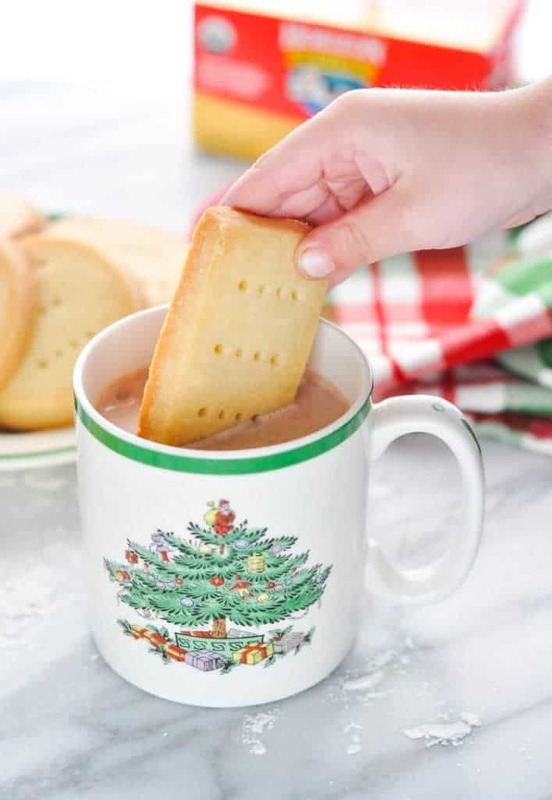 A sweet little package of these shortbread cookies, along with some gourmet hot chocolate mix or a nice new mug and some coffee beans, is the perfect holiday gift for your favorite teacher, neighbor, or co-worker! But you better wrap them up quickly, because the cookies disappear fast! How long do shortbread cookies last? These are a great make ahead holiday dessert because they last on the counter in an airtight container at room temperature for about 1 week. Yes! When wrapped tightly, the shortbread cookies will keep in your freezer for at least 3-4 weeks. Wondering how to freeze shortbread cookies? Allow the cookies to cool completely. Wrap cooled cookies (a few at a time) tightly with plastic wrap. Then wrap again in foil for an added layer of airtight protection. Stash the foil-wrapped cookies in large plastic freezer bags or storage containers. So what makes this shortbread cookie recipe BEST? It’s love, my friends! The cookies have been loved for generations, and they carry the special memories and the amazing taste with them in every batch! 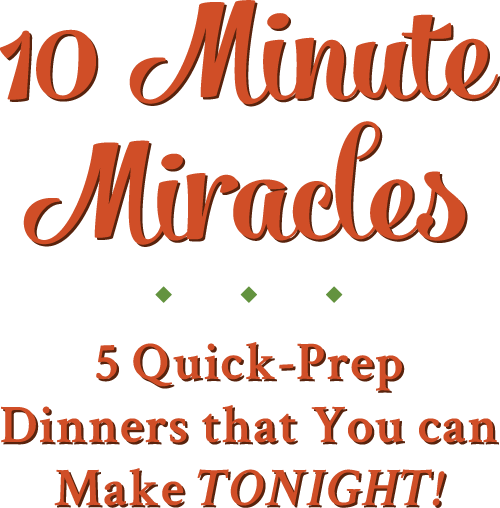 Preheat oven to 325 degrees F. Line two baking sheets with parchment paper or silicone mats and set aside. Place all ingredients in a large bowl. Mix with an electric mixer until completely combined and dough forms. Roll out dough on a floured surface (to about ¼-inch thickness, or slightly thicker). Use cookie cutters, biscuit cutters, or a pizza slicer to cut out shapes. 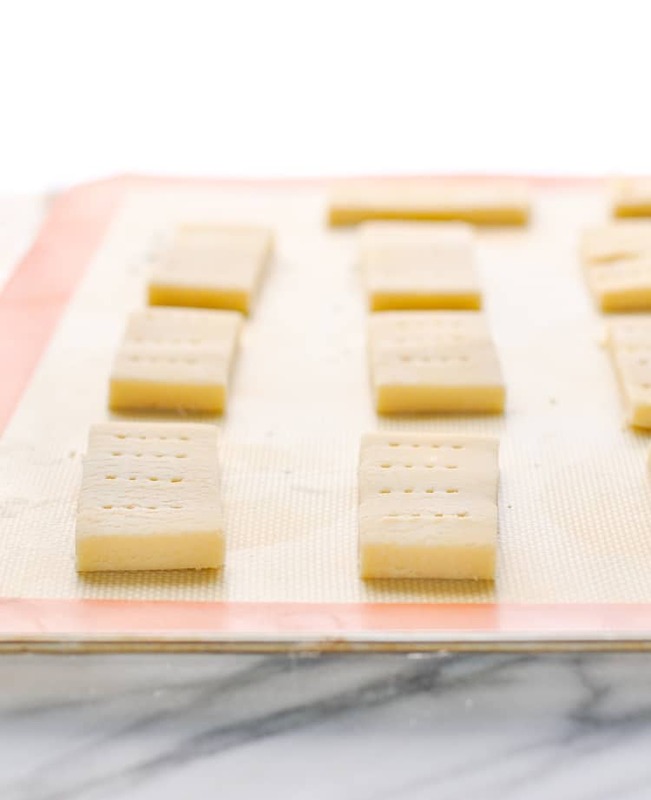 Place shapes on prepared baking sheets. Pierce with a fork. Bake 20 minutes or until just lightly browned. *You can use salted or unsalted butter, based on your own preference. 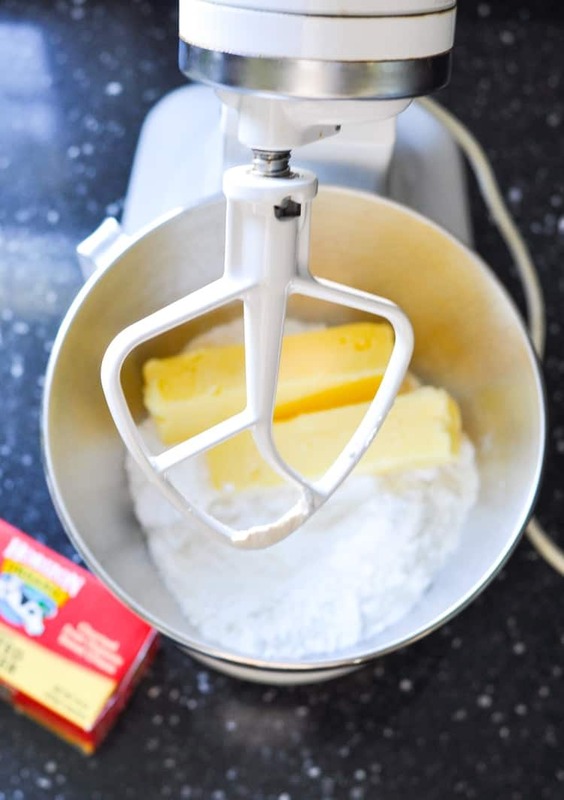 If you’re not using salted butter, you might want to add about ¼ teaspoon salt to the dough when mixing (if desired). **I used a 2 ¼-inch round cutter to yield 20 cookies. Great job, Spence! you make it loot SO simple and they\ cookies look real delicious; I plan to make a batch for my grandchildren this Christmas Season. Thanks for sharing, Spence and Merry Christmas to you all! Just finishing cooling my first batch from your recipe. It’s a keeper, very buttery I didn’t cut out, but instead made logs & chilled & sliced. Baked 20 min & got 32. Filled with black raspberry jam & got 16 sandwich cookies. Sounds delicious, Lorraine!!! Love the idea of adding the raspberry jam. We buy 8 grams sugar black raspberry jam at our local Mennonite shop. Hated raspberries when I was little, but love them now. Works excellent with buttery shortbread. This is a perfect treat recipe, Blair. Excellent combination of ingredients which I can easily have with a cup of tea. Can I use brown sugar for this recipe? Hi, Agness! I don’t think that the brown sugar would be an equal substitute for powdered sugar. The texture of the cookies would definitely be different, but I haven’t tested it myself to see if the final result would set in the oven or not. I have used brown sugar everytime I have have baked them. They are great. Short team cookies are always a favourite of ours as they’re so easy to make and so delicious! These look perfect! Definitely going to make these in the next couple of days. They sound sooooo easy and also sooooo good. Thank you so much for sharing! …and Merry Christmas to you and yours! I lost my Grandmother’s recipe years ago( Katrina). This looks so close to her recipe, but she used granulated sugar and called them ” sand tarts”….making yours tonight for my daughter’s school… can’t wait!!!! That’s great, Ed! I’m so glad that this recipe might remind you of your grandmother’s. Hope everyone enjoys the cookies! My Pennsylvania Dutch Mother In Law also called them “sand tarts”. She also rolled them paper thin, cut into Christmas shapes, and decorated them with colored sugar. I have a Scottish name, so I will make the rectangles. If you put granulated sugar into a little grinder/processor, like a coffee grinder, and add a little corn starch, you make confectioners sugar (which also makes a great frosting when you add butter, vanilla, and milk or cream). Could I use this recipe for a shortbread pie crust for a fruit tart? Hi, Evelyn! I honestly don’t know — I have never tried it that way. I think it would work fine, but I would roll the dough relatively thin for a tart crust and then prick it with a fork so that it doesn’t puff up too much. Just a thought! Great! I’m so glad that you enjoyed them, Antionette! Your additions sound perfect! Can you use terracotta cookie stamps when making these? I’ve been trying several scone recipes lately and now I’m moving on to cookies. This is by far the easiest cookie recipe with minimal ingredients I’ve ever tried. I did use 1/4 teaspoon of vanilla extract. The cookies turned out amazing and are lite and delicate,but full of flavor. I will be using this recipe again for my holiday baking. What is the purpose of pricking the cookies with a fork? I plan on making these for my oldest son. He loves these cookies and will sit and eat the whole pile of them in one sitting. It will be his Christmas present. Hi. 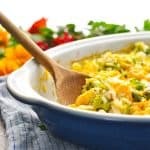 This recipe is identical to one my great grandmother made. She too was a Scot who passed it on down to us. 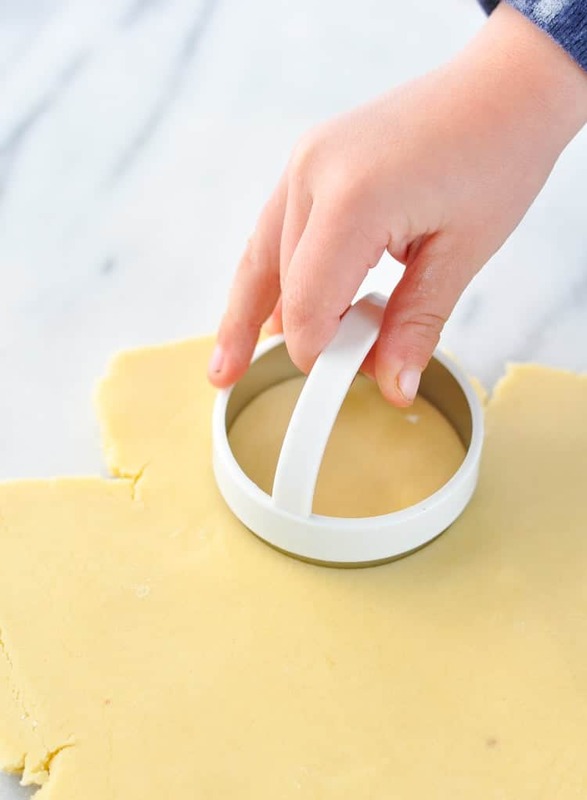 However, once the dough is prepared, she (and therefore us too) would gather enough in her hand to form a 1-inch ball, which would do onto the cookie sheet. 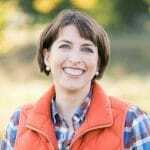 Once all of the balls were on cookie sheets – spaced sufficiently so that they will not touch once cooked — she took a fork and, using the tines, flattened each ball down to 1/3-inch thick. Once cooked, those ridges would brown a little more and create bits of toasted-carmel-like crunch. At Christmas, before flattening, we would out a piece of dried fruit or a maraschino cherry on top of the ball. They can easily be food-colored and adjusted to lemon, orange or other extractive flavors. Love em. Serve them hot from the oven at parties… Only two batches? No way. They’ll have those gone before the third and fourth batches are done! Just purchased a box of my favorite Walkers Shortbread and decided to find a recipe to bake my own. 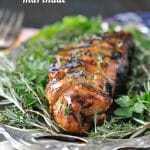 Your authentic Scottish recipe looks perfect. Think I will add a little vanilla and try the ball method and add a dried cranberry or a pecan to the top for the holidays. Many thanks. That sounds perfect, Marlene! Enjoy!!! Sounds delicious. My heritage is Scottish-English. My grandmother made yummy Shortbread! I’ve never tried but your recipe is win win. Can I spread it out on a parchment lined cookie sheet? If so how thick? Good morning Blair, I was wondering if you use salted or unsalted butter. Going to give these a try. Thank you. Hi, Anita! I use salted butter. 🙂 Enjoy the cookies! I would like to make these to mail for Christmas. Can i add sprinkles or nonpareils to the dough before baking? Or would the color bleed? Thanks! Hi, Anna! I haven’t tried it myself, but usually the larger sprinkles work well when stirred into dough like this. I find that the little nonpareils tend to bleed more often. Enjoy! Hey, Cindy! I’m not sure, because I don’t have a spritz cookie press. I’m not familiar enough with that device to know whether or not it would work. Definitely let me know if you give it a try! Thanks will do. In progress now. It’s a vintage press. So far it doesn’t want to release from the press the way spritz dough does. . Playing around with dough temps. But…..the dough tastes wonderful, lol. 🙂 I’ll take it out of the press if it won’t work, and follow your recipe. No worries.A win either way. Success! I ended up pressing them directly onto my sheet pan. It seemed like they didn’t want to grab the parchment paper. Dough temp didn’t need to be adjusted. Just room temp. Worked it together with my hands more to blend it. About 16- 17 min. Voila! Now to bake up the rest of the dough. Once cooled, I’ll dip the tips into colored icing, maybe followed by a little bit of colored sprinkles. Thanks! should the dough sit in the fridge before roll it or it’s not necessary? Traditionally, shortbread is made in rectangles or rounds, but also petticoat tails; or one large round (8 inches), cut into about 8 wedges. They are also made by hand, instead of a mixer; which gives the shortbread that lovely texture and flaky attribute. It should also be pale gold, and never brown. This is the only shortbread recipe I’ll ever need! It took me back to my childhood and the shortbread that my grandmother’s friend Sophie Scriffin made each year at Christmas. I was craving her shortbread and decided to give your receipe a try. Pure nostalgia and absolutely delicious. I did use one shortcut. Instead of rolling and cutting the dough, I patted the dough into a disposable, nonstick 11×14 parchment-lined foil pan, pricked it with a fork in rows, baked it, and then scored it while it was still warm. I also added 1/2 tsp of double-strength vanilla extract. Next time maybe I’ll try almond extract and rolling/cutting. If I used unsalted butter how much salt could I add to make it taste as good? Hi, Sharon! I made a note about that in the “recipe notes” section, but I would generally estimate about 1/4 teaspoon of added salt. Hope that helps, and enjoy! Love love love. Childhood returned. I remember my dad lining the cookie sheets with brown paper bags instead of parchment. Done and Done. The bag’s seem to give the cookies a little more crunch. Wonderful! I’m getting ready to bake a batch this afternoon! I agree — totally a childhood favorite! The paper bag tip is great! Is the confectioners sugar the same as powdered sugar? If not can I use powdered sugar instead? 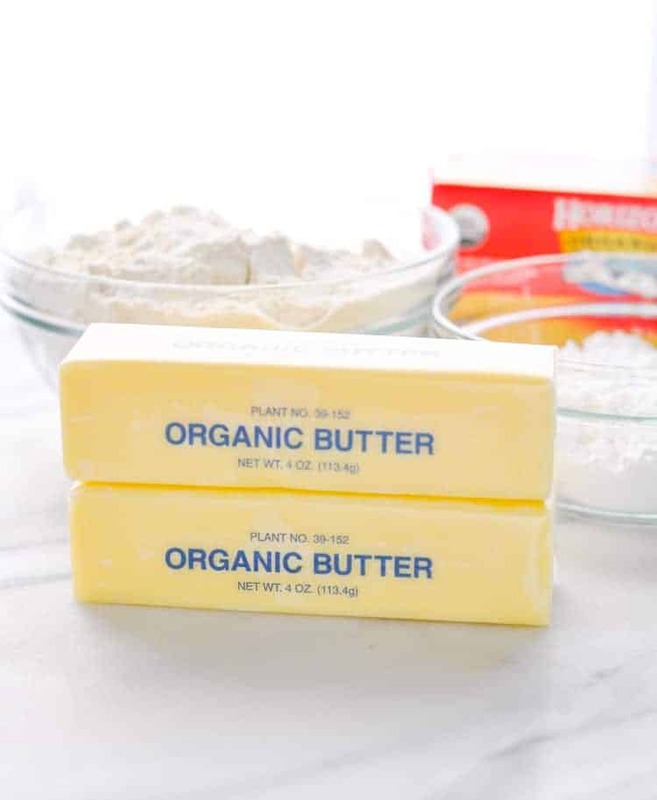 Does the type of butter matter? I was thinking of using a European butter with a higher fat content. Also, I want to use my Nordic Ware Holiday cookie presses, would I still need to prick holes into the dough? Lastly, I know the recipe calls for icing sugar, but have you ever tried using caster sugar? My Dad makes shortbread cookies with regular, granulated, sugar which made me wonder if using caster sugar since it’s more fine would be ok, too. Hi, Landy! I’m not familiar with European butter, so I don’t know if it would change the texture/flavor of the cookie or not. I’ve only tested these with regular butter. If you don’t prick holes in the dough, the dough will puff up a lot. If you don’t mind that when using your press, then you can skip the holes. If you Google “caster sugar” there are several articles describing the differences amoung granulated, caster, and powdered sugar. Here is one of the best: https://food52.com/blog/21097-what-is-caster-sugar-does-it-really-make-a-difference-in-baking From reading this article, it seems like caster sugar should work fine – maybe even make the cookies a little more “English Isles like”. I do not mean any disrespect but I believe the key difference between shortbread and scottish shortbread is in the ingredients and texture. Scottish shortbread often include leaveners or a lower gluten flour (like oat flour/ rice flour) resulting in a texture different to the typical shortbread. *which is probably why one of your readers had asked about the oat flour substitution haha. My family’s traditional recipe is as above with one exception. 1/2 cup of the flour is replaced by 1/2 cup of rice flour. This gives a softer crumb but the cookies still hold their shape. 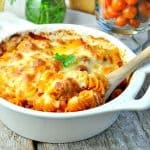 Love the recipe and plan to use it later. Brings back memories of my great aunt’s shortbread long ago. Have you ever substituted corn starch for the flour? One of my aunts made that change, but darned if I can find her recipe for it. any thoughts? Hi, Joanie! I hope you’ll give it a try! Hi Blair, thanks for the recipe. I’m trying to find the right cookie to reproduce my 70-something neighbor’s memories of his grandmother’s Christmas. I don’t know what I’m doing wrong, but the dough (and every other shortbread dough I’ve tried) is frustratingly crumbly – won’t stay together when cut into cookies, and falls apart even more when trying to prick with a fork. Would it help to work it more (knead, or beat, or whatever) to activate the gluten? Or perhaps chill the dough after rolling? I chilled it before rolling, but that just seemed to make it harder to flatten. Help! Do you have to poke a hole in the cookies? I don’t want to decorate them but I don’t want holes in them. Will anything happen if I don’t poke a hole? Great tip, Shanta! Thank you! Just made these yesterday none of them needed to be poked. None puffed at all. My dough ball never formed. What did I do wrong? Hey, Sherry! I’m sorry, but since I wasn’t in the kitchen with you, it’s impossible for me to know what you did wrong. Did you accidentally mis-measure one of the ingredients? Was your butter not at the right temperature? I haven’t had that problem myself, and I don’t know how you prepared the dough, so I’m not sure what went wrong. Now I’m embarrassed. I just re read your shortbread cookie recipe and I did put in too much sugar. In fact u is almost identical to my usual one that I’ve used forever! I apologize!!! I usually read a recipe at least twice, this time I didn’t. Big mistake. I baked these for my husband’s birthday and it’s pretty horrifying how delicious these are. I mixed this by hand and used a cookie cutter for the shapes. This is 100% my favorite cookie of all cookies right now. Thank you so much for this recipe! It truly melts in your mouth. Hi Blair. This shortbread recipe is exactly the same as our family one. My maternal side were from Scotland. Simple recipe: 2 parts fine white flour+1 part butter + 1/2 part fine sugar or confectioners sugar. Options include adding a small amount of almond paste, vanilla, or sweet brandy (very small measure just for taste). 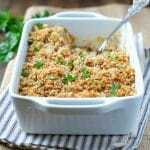 I often add just a wee bit of finely ground pecan meat and nothing else. Very good with white (with cream) Earl Grey tea. That’s awesome, Larry! I’m glad to know that it’s “authentic” as far as you’re concerned, too! 🙂 Simple, yet delicious! Can you do this dough in a food processor?